LUCKY is an ambitious show, following the journey of Lucy, a shy and bookish seventeen-year-old from Manchester. After her mother’s sudden death, Lucy is taken to live with her estranged father, who turns out to be TV personality and infamous womaniser Ricky Pense. In order to revive his career, Pense capitalises on this reunion, documenting it on a “reality” TV show. Beneath the veneer of perfection, Lucy feels the loneliness of the situation. Everything around her, her relationships and even her thoughts are fake, and she is being edited to portray a different and more ‘likeable’ person on the big screen. Lucy grapples with this feeling alongside the ostensible fortune of her situation, an internal conflict which brings the events of the show to a heady climax. Ashleigh Weir has done a commendable job in the challenging task that is writing the script for a Fringe show. The characters are well-defined, the dialogue realistic, and the overall plot generally well-thought-out and realised. It seems to give unusual weighting to certain characters, however - most noticeably in the lengthy monologues given to Viv, PA to Ricky and the brains of the Pense project. These moments never dragged, however, and Martha Cook gave a stand-out performance in a role that could easily have been overdone. A small authorial problem came with the overuse of the word ‘lucky’. Audiences are already alert to this word from the title, and it is obviously an essential part of the internal battle that Lucy (handily named, one letter away from ‘lucky’) faces, but Weir should have more confidence in her writing: she doesn’t need to spell it out for us. So far I have not mentioned the score: and this is because LUCKY is barely a musical. It’s more a play with songs interspersed throughout, but the songs seem neither particularly necessary nor enlightening with regard to the overall concept of the show. On the whole, the songs were forgettable, and at times difficult to follow and poorly-pitched to suit the emotion. It seems there was some attempt to mimic Sondheim, or perhaps a more recent trend popularised by Lin Manuel-Miranda to place syllables off-beat or run over bars in an unusual way, but this was ineffective. Lyrics were lost because of their speed, and occasionally slipped into incoherent rap. In this way, the book and score were glaringly detached from the rest of the show, and the music suffered for it. It must be admitted, however, that the band, led by Michael Cullen, were faultless. The score would have benefitted from a greater depth of sound, but in this small production the five musicians were more than enough to carry the show well. The nature of putting on a musical at the Fringe means quick turnarounds (indeed the cast and crew practically came out with the audience so that the venue could start the next show). With this in mind, the minimal set of vibrant, block coloured banner stands was enough to illustrate a cheesy TV set (think “Corny Collins Show” from “Hairspray”). The costumes were similarly basic, with the ensemble predominantly wearing black, allowing them to switch between roles with ease and versatility. The lighting at the venue seemed disappointingly simplistic, at no fault of the fantastic tech team who were otherwise slick in their transitions and clever in their manipulation of the kind of resources that were incomparable to the likes of the ADC. Joy Gingell as Lucy gave an understated performance, and this worked well to highlight her displacement against the extravagance of other characters such as her father. Although this made the show’s rapid climax rather implausible, it seems more the fault of the time constraints of the Fringe hour rather than Gingell’s acting ability. The energetic ensemble of Priya Edwards, Jonathan Iceton, and Henry Wilkinson carried the show with versatility and comic relief. Unfortunately, I feel that Henry Eaton-Mercer was miscast as Ricky. 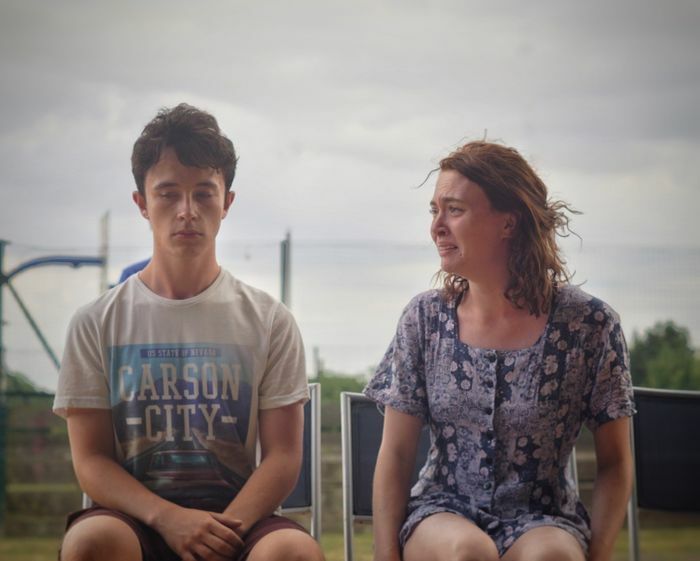 His acting was stellar, with great timing, presences and interaction with others on stage, but ultimately he couldn’t quite carry the unbearable ‘lad’ quality that Pense is supposed to epitomise - it felt as if every time he said something derogatory, he wanted to apologise. All in all, Lucky deserves praise for what it is: a new show, put on in the whirl of the Fringe, written by students alongside their academic work and delivered with the professionalism of some of the finest actors and tech team in Cambridge. The difficulties they faced have, however, inevitably played a part in the quality of the performance. I feel it has not quite fulfilled its potential, but would definitely do so with greater time invested into its composition.